things that make me happy! : Love To Wander ! Finally, after months of preparation, we are ready to GO LIVE! Yes, Love to Wander goes live! 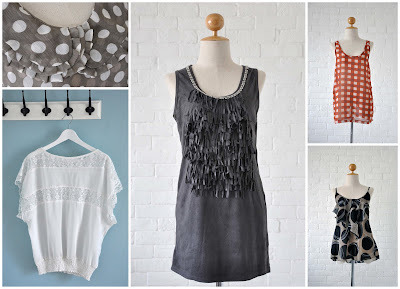 Love to Wander's our online shoppe - you can buy clothes!! Our being me, Lak & Kay's brainchild. Lak & Kay have always been my top travel mates. For the past few years, we are bound to take at least an overseas trip together. Each of us complemented well - lak being the planner, executer, researcher, map reader - kay being the entertainer - and me being the $ controller (simply cuz that's probably the easiest no-brainer thing to do (but when a guy joins for the trip, he takes over). Sometime late last year, we decided to combine our passion for travelling and shopping to start an online shoppe. As always, the easiest is to decide what to sell, the hardest at the initial phase is the name. We decided to use our initials to Lak , To & Wong and combine it with our wanderlust ... and ta da! Love To Wander! I guess everyone would have at some point in time tried shopping and buying clothes online. I have done my fair share but often ended up being dissappointed. Very often, the clothes looks darn good in pictures and the actual product turns out horrible, or the sizes dont seem to fit or the delivery time is way too long. I understand many blogshops locally do back-to-back delivery - meaning, they order only when they get confirmed orders from customers and that will increase delivery lead time. Also, the postage charges are artifically high. So what do i love about Love To Wander? And how are we different? - We only sell what we have in stock locally. Meaning, if u dont have to wait few weeks to a month for the delivery. You get it almost within a week. - Our prices are NET prices, inclusive of postage charges. This means no hidden costs at checkout. But if you require registered mail, we have that option at $2.24 only, which is what Singpost charges - we do not charge mark up on that. - We QC our stuffs before selling. Meaning, if there are loose strings around, we cut them etc. - We only sell what we would want to wear ourselves - this would mean it may not be the latest fashionable item but its definitely still pretty & wearable.